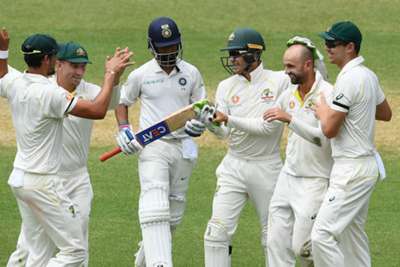 India's tail must show greater application than they did on day four of the first Test against Australia, according to batting coach Sanjay Bangar. An 87-run union between Cheteshwar Pujara (71) and Ajinkya Rahane (70) helped India to 234-3, but they were bowled out for 307 as spinner Nathan Lyon (122-6) helped bowl Australia back into the match. The tourists lost their final five wickets for 25 runs - the last four going down for the addition of just four runs - with Australia reaching stumps on Sunday at 104-4 in pursuit of 323. On India's collapse from 303-7, Bangar said: "We were expecting at least 25 runs from there. That is an area where we are continuously looking to improve. "We are hoping the lower order, especially the tailenders at nine, 10, 11 show a bit more application than what they did today." Rishabh Pant sent Lyon to the boundary three times in succession and added a stunning slog sweep over deep square to total 18 runs from the first over after lunch. While Pant was caught in the deep off the same bowler from the next ball he faced to spark India's rapid demise, Bangar is not overly concerned about the wicketkeeper-batsman's aggressive approach. "When he walked in, we were 260-odd  and immediately he released the pressure. He gave us those 25-30 quick runs," said Bangar. "And once he had put us in that position, we expect that with time and with a bit of a better approach, a better mindset, and better calculation, he could have done better. But we don't really want to take the fearlessness out of any player. "Hitting against the turn, getting those boundaries, they were high-percentage shots and you have seen many players who have been courageous play that. So it's a mix of caution and aggression and with time he will develop."